Even though he can't run for re-election and he's not running for anything else we know of, Gov. Bill Richardson's gubernatorial campaign is still raising and spending a little money. 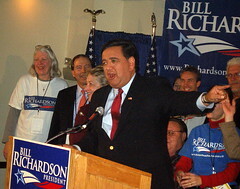 Technically, Richardson's last state campaign was in 2006, when he won his second term. But according to his latest campaign finance report, filed Tuesday with the Secretary of State's Office — just like the reports of those candidates who actually are running for office — Richardson's campaign raised more than $12,000 between May 5 and Oct. 5 and spent more than $58,000. He had $115,758.78. There's nothing illegal or even unusual about politicians using their campaign funds for things other than campaigns. New Mexico's laws are relatively lax on this, and thus you have legislators using campaign money for expenses incurred during legislative sessions, travel to out-of-state conferences, etc. By far, Richardson's largest contributor in his latest report was Nexus Direct, a direct-marketing company based in Virginia Beach, Va. The company gave him $11,565. There is a connection between the governor and the company. Its founder and CEO, Suzanne Cole Nowers, was in charge of direct marketing for the Richardson presidential campaign. So how did Richardson spend its money in the past five months? He donated $1,000 to the Lantos Foundation for Human Rights and Justice, a Concord, N.H.-based charity formed to further the legacy of the late Rep. Tom Lanton, D-California, former chairman of the House Foreign Affairs Committee and the only Holocaust survivor elected to Congress. He contributed $2,000 to Santa Fe Mayor David Coss' re-election campaign. He paid $1,611 to the Sandler, Reiff & Young law firm in Washington, D.C. I'm not sure what legal services were performed there, but I bet it's something mundane. $1,600 doesn't buy much in the way of lawyering. But most interesting was $38,353 paid for "research/polling" to a company called Fairbank, Maslin, Maullin & Associates in Santa Monica, Calif. Nearly all the money was paid in June, a much smaller chunk paid in September. We don't know what kind of polling was done by the Santa Monica company. Nobody on the governor's public information staff responded to e-mails asking about that. Richardson's campaign committee has slowed down in the areas of spending and fundraising. In its previous report in May, the committee reported raising $105,000 and spending more than $490,000. But it's still alive. The campaign is spending hundreds of dollars a month on telephone service from three companies — $1,477 in September alone. And it's paying an Albuquerque storage company $298 a month. What are they keeping in there? Is that where they're storing Richardson's fabled political machine? A decent time slot for Lorene: It's good to have a "neighbor" like Lorene Mills. 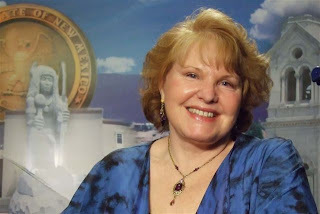 She uses the television studio next door to my office in the Roundhouse each week to tape her show Report from Santa Fe. Because of that, I've met many national figures — among them Joe Wilson and Valerie Plame, Noam Chomsky, Arianna Huffington and retired Brig Gen. Janis Karpinski, who was in charge of Abu Ghraib prison in Iraq. Also, her show has come in handy when I need to talk with legislators or other politicians who come in to do her show. But for years, poor Mills has had to contend with what I consider an inhumane time slot — 6 a.m. on Sunday. No more. Starting Friday, Report moves to 10:30 p.m. Friday nights on KNME, Channel 5. It's not exactly prime time, but it's a lot better than 6 a.m. Gov. Bill Richardson is her first guest on the new time slot. And on Sunday morning, the show will be rebroadcast at 7:30 a.m. — which also is better than 6 a.m.
And in case you want to check out some of those shows you missed on early Sunday mornings, check out the archives at Report from Santa Fe Web site at www.reportfromsantafe.com. Who Benefits from Heather's Decision? Wilson Still Not Ready to Jump in Gov Race. I Bet She's Going to Be on the Ballot.